If you are 17 or under, a federal prosecutor could have charged you with computer hacking just for reading Seventeen magazine online—until today. It’s not because the law got any better. Earlier today, we wrote about news sites that alarmingly prohibit their youth audiences from accessing the news and the potential criminal consequences under the Computer Fraud and Abuse Act. 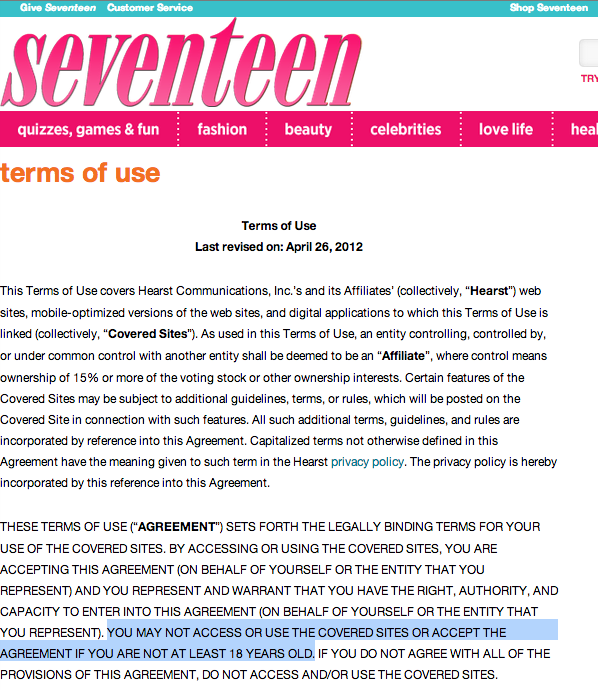 In response, the Hearst Corporation modified the terms of service across its family of publications, including the Hearst Teen Network, which notably includes titles like Seventeen, CosmoGirl, Teen and MisQuince. Seventeen highlights the absurdity of giving terms of service the force of law under the CFAA. It boasts a readership of almost 4.5 million teen readers with an average age of 16 and a half, and yet, until today, the average reader was legally banned from visiting Seventeen.com. That’s right, for a magazine dedicated to teen fashion, the publisher’s terms explicitly restricted online access to readers 18 and older. What’s worse, the Justice Department could choose to bring the might of the government to enforce this contract against a Seventeen reader who may never have even seen the agreement. Federal prosecutors have argued in court that accessing a website in violation of terms of service is a crime. If the website’s terms, like Seventeen magazine’s previous version, explicitly state that you must be an adult to visit their sites or participate in their interactive features, then teenagers accessing the site “without authorization” under the CFAA and could be doing jail time, according to the DOJ. YOU MAY NOT ACCESS OR USE THE COVERED SITES OR ACCEPT THE AGREEMENT IF YOU ARE NOT AT LEAST 18 YEARS OLD. The revisions are dated “April 23, 2013,” but presumably they meant April 3. Thank you Hearst, we appreciate your prompt response. But the real problem is the CFAA, which allows prosecutors to use these silly terms to manufacture computer crimes. And prosecutors have plenty of opportunities, as ridiculous terms of service abound throughout the Internet. We also previously reported on a variety of other websites—including the New York Times, Boston Globe, and NPR—that have similar terms of service that restrict people 12-and-under from reading the news. Atlantic Wire expanded on our blog post by pointing to even more news sites that do the same thing. While these terms weren’t as absurd as Hearst’s, Atlantic Wire also highlighted the law’s farcical implications using photos showing which of Shaquille O’Neal’s children were allowed to visit a lengthy list of news sites. Thankfully, the Ninth and Fourth Circuits have rejected the government’s aggressive interpretation of the CFAA (with amicus help from EFF), but the Justice Department has shown no signs that it has given up on aggressive interpretations. The vague language of the law could turn virtually every Internet user a potential criminal, allowing the Justice Department to use their discretion to go after any citizen they don’t like, rather than only harmful criminals the bill was intended to stop.